Microsoft Office is still the pre-eminent office suite and is now available for iPad, Chromebook and web through Office 365, as well as the traditional Windows and Mac. This means that your staff and students are accessing Microsoft Word on lots of different devices – operating systems, form factors, software or apps or web. When they need assistive technology like ClaroRead, how do you support them? Make them use the computer in the corner with the one licence of the Windows software you bought two years ago? No. 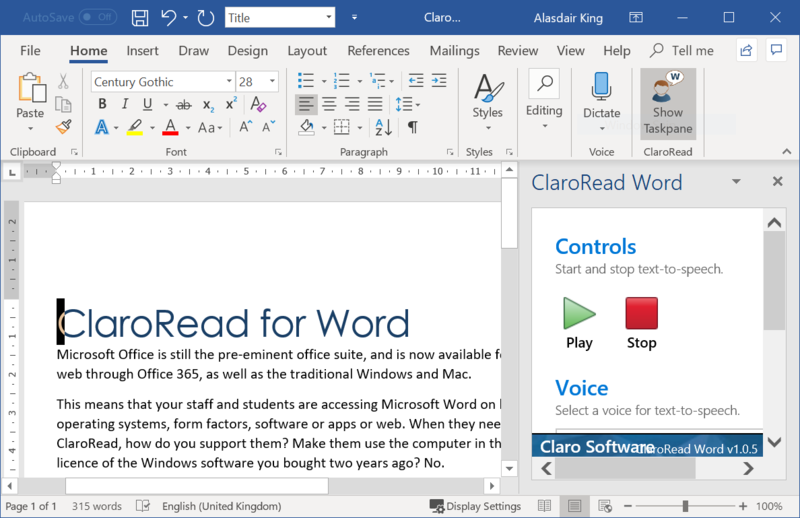 ClaroRead for Word uses the latest Office 365 technologies to bring our world-class text-to-speech, spellchecking, prediction and usability tools to anyone using Microsoft Word through your Office 365 subscription on Windows, Mac, iPad, Chromebook or office.com Web Apps. Just install through one action in your Office 365 Admin panel and ClaroRead is available for every user – but of course only if they select it from the ribbon! Playback your document exactly as you see it on the screen – no need to change mode – so you can follow easily what you are working on. Highlight the current sentence as it goes so you can track the sense of your writing. Choose the colour of highlighting you want to use to maximise sense and comfort. Select any text to hear it read aloud – super-simple. ClaroRead for Word is included in any Claro Annual subscription and ClaroRead 365. Word 2016 for Windows (requires an Internet connection) or later. Word 2016 for Apple Mac or later. Word Apps in the Windows Store are not supported. Word on Android is not supported.